Introducing the all new Tennant M17 battery powered rider sweeper/scrubber; manufactured in the United States of America. This machine is extremely reliable and consistent allowing you to cut costs on keeping your facility clean. 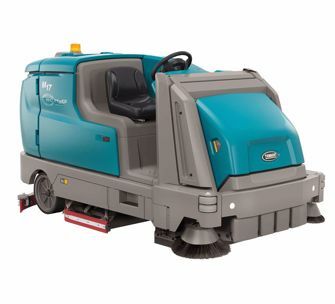 Maintain the safety and health of your employees and guests by keeping your floors in great shape with this brand new ride on scrubbing and sweeping machine. The M17 is available with many standard as well as customizable features. With all of the controls located directly on the steering wheel in an easy to use fashioned, virtually anyone can use this machine with minimal training. Leaving your floors dry and ready to use almost immediately, the Tennant M17 allows you to keep your business running smoothly with minimal interruption. Find the Tennant M17 Sweeper Scrubber being used in many different applications, some of which are highlighted below. Not sure if the Tennant M17 will suit your needs? Contact us and a Machine Specialist will help you out! Dimensions: 112" x 54" x 58.25"